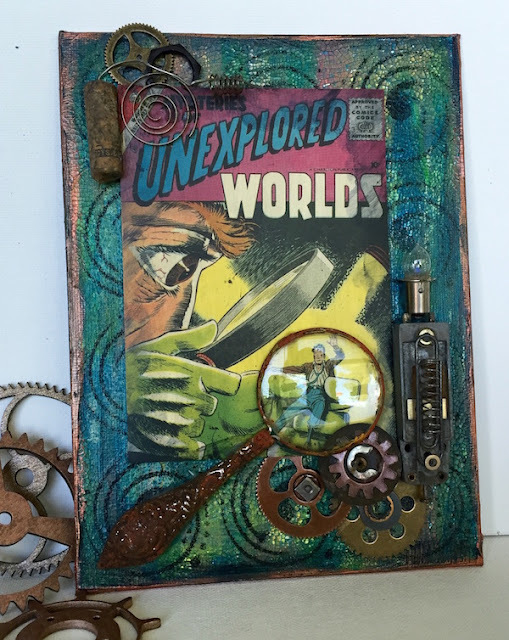 This time our talented DT member Nate has created a project to fuel your creative steampunk mojo! Transformation d' un grimber en maître du temps monter sur une boite en carton , travaillé avec papiers métal et peintures DécoArt. 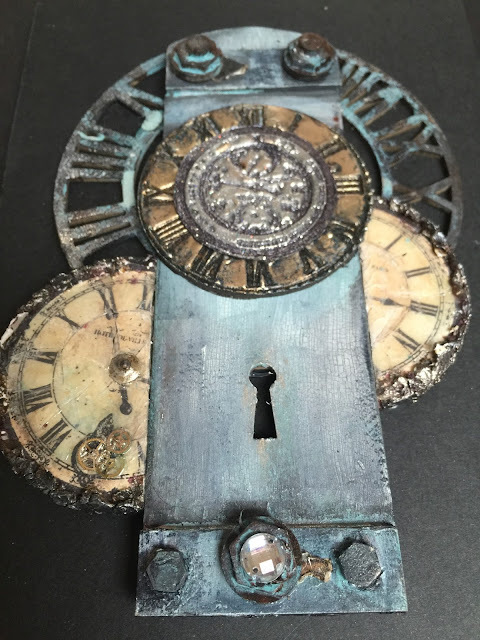 An altered box with the "Master of Time", covered with metal foil and painted with DecoArt products and paints. The embossed and painted panels to cover the box with. 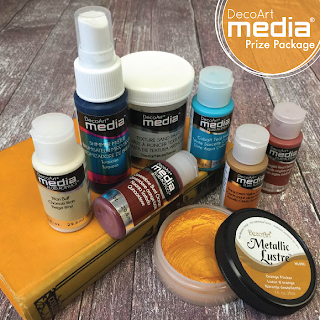 Sides, box feet and clock face were painted with DecoArt Americana acrylic paints. What a beautiful clock face! And that iron gate is just the perfect addition! When the gates of the box open, you can see the hour glass in front of the clock face. And thanks for stopping by, dear steampunk friends! There are still two more weeks time to join in our summer challenge! We hope to see your fantastic projects being shared with us soon! 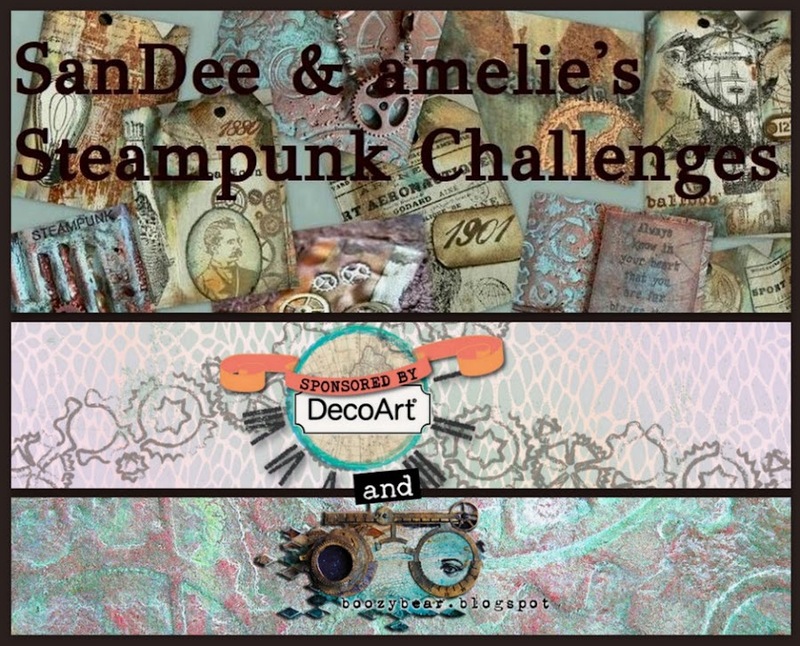 Hi, dear steampunk friends, and welcome back to part two of our summer special challenge! There were already so many fantastic entries and the team and I are very thankful and happy that you find the time to create and share a bit of steampunk goodness with us during your summer holidays! We can't wait to see what August brings! Our summer challenge always is open for two months and this time we also accept five instead of just three entries per player. Aaaaand...there are also three prizes to give away instead of two as usual! 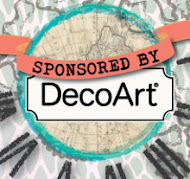 The fab little DecoArt Media steampunk starter pack and two boozybear steampunk chipboard surprise packs this time! and we welcome any sorts of handcrafted goodness, as long as it follows the theme and our few challenge rules! So maybe - on a rainy day - check out the makes of Team B, Team A (by clicking HERE) and also our Top 5 (which can be found on our pinterest board HERE), get yourself a good dose of steampunk mojo and create away (and don't forget to enter your finished project to our inlinkz collection at the bottom of our post!). And if you want to make someone happy - visit the blogs of our DT (by clicking on their names) to find out more about their projects and the how-to and leave them a short comment. That would be fantastic and so lovely of you! 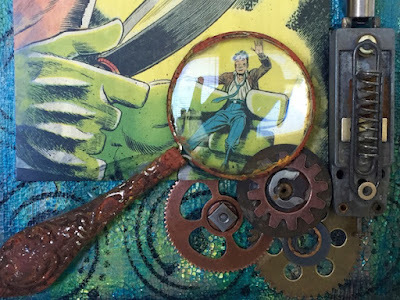 my antique rusty junk and a bit of storytelling !" 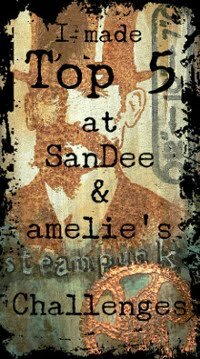 ...takes you with her on a dive into the fascinating underwater steampunk world. paints, antiquing creams and mediums. 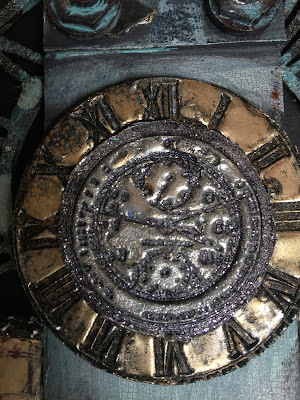 Here is a close up of the triple embossed clock face. "I have altered a little notebook using DecoArt paints, black Gesso and modelling paste. stencils and - one of my alltime favourites - shrink foil! It's so much fun!" Use your favourite steampunk rubber stamps and display them all at once - no matter what size they are! Shrink foil helps you to combine even larger images on a single project! Use gilding pastes like paint with stencils to create words with fantastic metal sheen! So here it is - your bundle of inspiration for August! There will be some "Extra Steam Power" a little later this month - so stay tuned! We hope to see you play along with us soon! Hags, happy summer and happy crafting!